TemplateHack.com - Download Lucy Beauty premium blogger template. 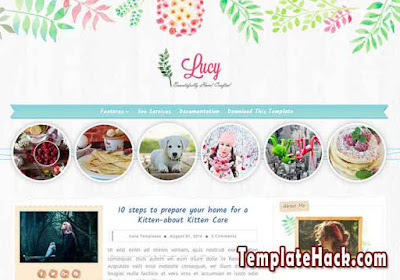 Lucy Beauty is beauty fashion blogger template. This template has a unique design. Look at the preview to see the amazing typography and layout design. Or you can see the preview by clicking the demo button. Lucy has amazing view on home page. It is has Instagram looking featured post. The featured post inside this template made by adapting from InstaStory design. Get this Lucy Beauty blogger template and applied on your fashion or beauty blog. It is free premium blogspot template for you. About Me, Featured Post, Girly, High CTR, HTML5 Valid, Instagram Ready, Page Navigation Menu, Photo Profile, Post Thumbnails, Responsive, Search Box Button, SEO Friendly, Stylish, Typograhpy, Elegant, Unique, 1 Right Sidebar, Blue, White, Orange, 2 Columns, 1 Column Footer. Anime blogger template, Beauty blogger template, Daily Blog blogger template, Fashion blogger template, Food blogger template, Gadget blogger template, Gallery blogger template, Health blogger template, OOTD blogger template, Portal blogger template, Recipes blogger template, Reviews blogger template, Travel blogger template, Viral blogger template, Design blogger template, Art blogger template.